In a straight line from the main entrance of the Cincinnati Art Museum, past the sequestered “Icons” spotlighted in black caves, through the spacious hallway, footsteps echoing loudly, stood the very dead “Tree of Life”; its roots unlaced and scrabbling for footing on the shining floor, its branches hung with strings and painted with white silicon paint. Didactics on the wall beside it try valiantly to endow it with purpose, but it stands stripped of its past glory; stark and white and dead. The Tree of Life has been a symbol of named and nameless religions as long as an awareness of mortality has existed. It stands implacably in paintings, statues, prints and in the world around us creating oxygen, sustenance , and comfort, which explains my personal confusion at this proclaimed “holiday tradition” which appeared dramatically before a floor-to-ceiling window just outside the Cincinnati Wing. A story accompanies this exhibit. This crabapple tree died recently. 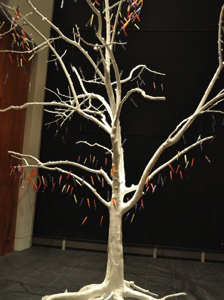 Rather than simply removing the tree, Covington artist, Matt Kotlarczyk, proposed that it become an interactive symbol of the New Year and new beginnings as an installation piece in CAM. Visitors to the museum would hang messages in this vein on colored papers inserted into glass vials suspended from its branches. These transparent colored decorations would serve as colorful replacements for the missing leaves. The vials would then be taken down and delivered to Eden Park where they would be burned after January 1, their ashes intended to become fertilizer for a new crabapple tree on museum property, Burning bowl ceremonies in area New Year’s ceremonies are based on this same concept. Hanging paper wishes and prayers are a Chinese tradition, as well, and the idea was seen in the Cincinnati art community during the now defunct Art on the Square art shows held on Fountain Square a number of years back. Assembling all of these re-used premises, illustrates little originality, which leads us to the tree itself. Shining silicon coating, which was was chosen ostensibly to preserve the wood, seems only to emphasize its lack of life. Any evidence of artistic intent is difficult to discern. The logistics of transporting the tree included sawing off branches and re-attaching them yielding an even more barren ambiance. All of those messages, regrets, resolutions didn’t quite make it into ashes, either. Instead, their final disposition involved sending the papers into the atmosphere via balloons, defeating the element of regeneration. I saw the tree with some friends, and wondered if perhaps I expected too much of a holiday installation at CAM. But their amazement at the incongruity of the tree seen in such a respected institution easily equalled mine. Cincinnati has proven talent a-plenty simply waiting for chances to exhibit within those hallowed walls. The press release description of a “community tradition” implies more than this. However, according to Jessica Stringfield, CAM’s Marketing and Communications Associate, about 2,000 people filled out wishes.